And the Best Oscar Entree goes to...YOU! Come and accept your award winning chow and pass it around to your Oscar party guests. Start with a dish straight from the American heartland, Nebraska Roasted Cream Corn. In the movie Bruce Dern plays a crotchety old coot on a journey to collect his (imaginary) sweepstakes winnings. 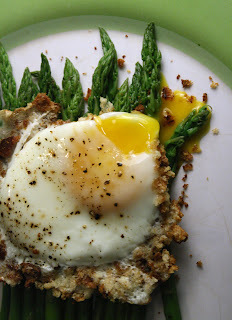 And this dish from the Cheap$kate Critic is perfect to serve retirees in an old folks' home. Chowing down on the tender kernels of smokey corn (slow-cooked in half and half) the seniors can leave out the dentures, turn up their hearing aids, and enjoy the Oscar telecast. 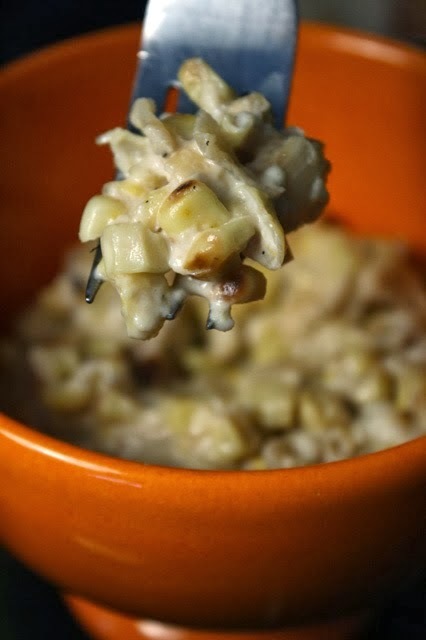 For my Nebraska Roasted Cream Corn recipe click here, and the trailer is here. Belly up to the BBQ grill and get some vittles.You'll get raucous whoopin' and hollerin' when you bring out a platter of my Dallas Buyers Club BBQ Pulled Pork Sliders. The heck with movie star dieting -- as you watch these anorexics amble to the stage to accept an award, you can kick back with a brewski and indulge in meaty smoked pork sliders, with a side of coleslaw. Just click here to get a gander at all the recipe details. My video recipe above uses hamburger buns, but get more of a spread with smaller dinner rolls to make BBQ Pork Sliders. The Dallas Buyers Club trailer is here. 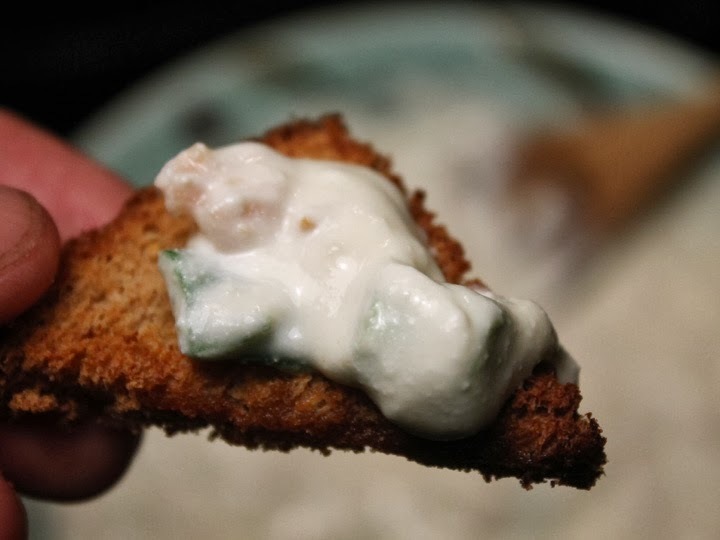 My East Coast-style American Hustle Clam Dip will have your guests doing the Bump in no time. While the movie is just warmed-over and microwaved Scorsese-lite, it's still a good-time confection. Made with drained canned clams and sour cream, this pungent white dip is as classic as a disco leisure suit. 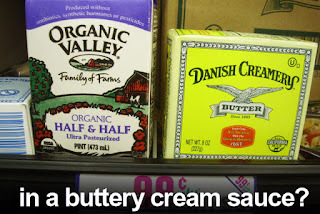 Use low fat sour cream, so you can bust a move while tripping the light fantastic on the dance floor. 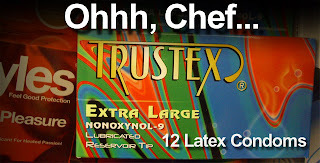 It's time to adjust your comb over and get to mixing up my tasty appetizer by clicking here. To see what I'm rapping about, click here and watch the American Hustle trailer. 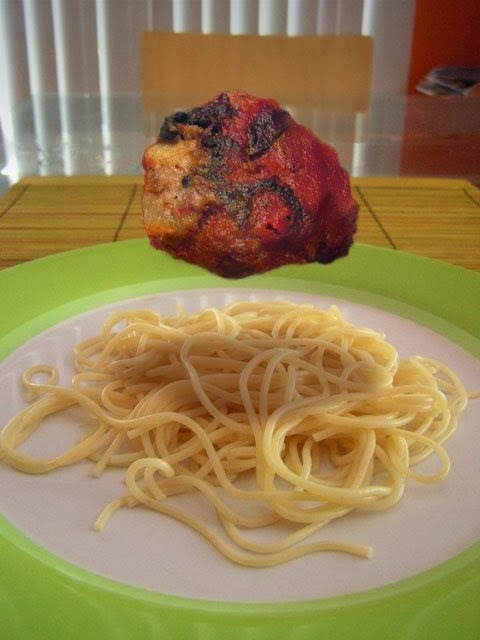 One bite of my Gravity Lighter Than Air Meatballs and your party will float on cloud nine with pleasure. I make my meatballs with ground turkey or chicken, and toss in some cooked spinach and toasted bread crumbs, along with an egg. This cuts down on the fat, so you can fit into any cramped quarters. And I guarantee no leftover debris on the plate. Click here for the recipe, while the movie trailer is here. In the Best Actress nominated Philomena, Judi Dench gives up her conceived-out-of-wedlocked child. 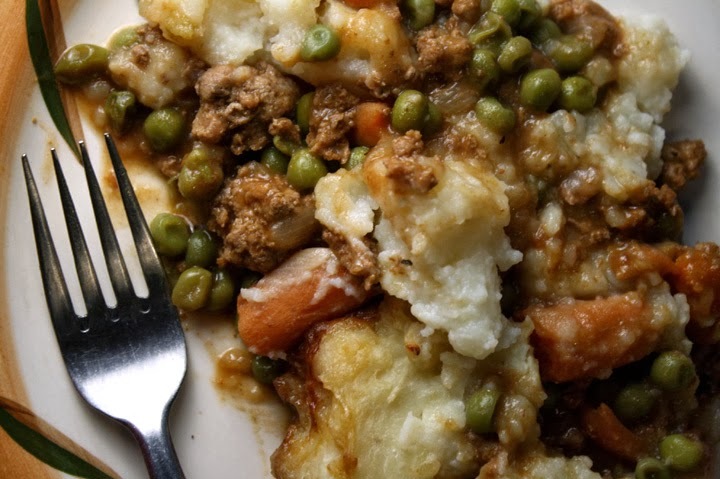 Well, just place a large luscious plate of Philomena Irish Shephards Pie and I guarantee orphans from everywhere will beat a path to your Oscar dinner table. An if your a man of the cloth, then you'll hold your head up again if you spoon out extra large servings. And the recipe is just a click away here. To see the Philomena trailer just click here. Hey, wealth-extracting Wall Street fat cats, come and get it. If you're like the predatory slime depicted in the Wolf of Wall Street, I have a way you can redeem yourselves at your Oscar Party. 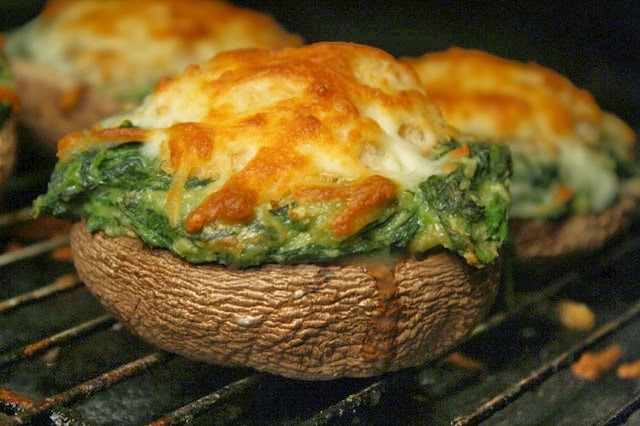 Put on the Ritz and serve up some Wolf of Wall Street Portabella Crab Rockefeller. The recipe is so easy even a hedge fund manger can make it! 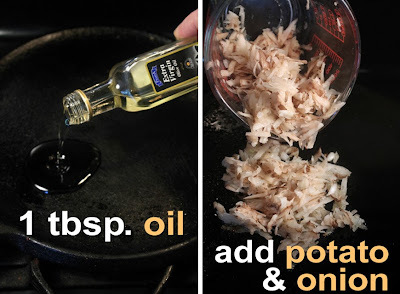 I created this recipe using a Tiffany tinned bauble of canned crab, but if your stock just spit then get expensive fresh crab from your fave seafood market. For the rest of us in the cheap seats, fake krab is a tasty budget-wise substitution. I often find expensive portabella mushrooms at my local 99c only Store. The other ingredients of cream, spinach and cheese are cheap enough. So click here to get the recipe and serve up my Wolf of Wall Street Portabella Crab Rockefeller and watch as your guest swing from the chandelier with delight after a few flutes of champagne and this rich tasting entree. The Wolf of Wall Street trailer is here. Throw off the chains of haute cuisine and dish up my Southern comfort entree, 12 Years a Slave Black-eyed Peas. This pot of goodness will have your Oscar party guest scraping the plate for every tender legume. And, man is this entree cheap. From the sweat of your brow, you'll get enough food to feed your captive Oscar audience. My recipe is here, and the 12 Years a Slave trailer is here. Hmmm...don't quite know how Her made it into the Oscar category amongst such heavy hitters. With a limp biscuit of a character that even Jaoquin Phoenix can't leaven, this fattened souffle of a flick left me starved for entertainment. But my Her LA Street Hot Dog is a perfect contrast to the bland flavors delivered by that milktoast movie. A LA Street Dog is wrapped in bacon and topped with grilled onion and bell pepper - it's one delish hot mess your guest will fall-head-over-heals for. Just check out my recipe video below, and click here to see the Her trailer. So try out any of my Oscar-themed recipes. You're sure to get a standing O, and have your acceptance speech ready because the golden statuette for Best Entree at an Oscar Party will be yours. And as a special bonus here is my Oscar Special video from a few years ago -- just check out the Cheap$kate Thespian hamming it up. Some people have all the luck. Well I don't, but sometimes a small portion comes my way, doled-out in the form of vacuum-sealed packages of raw tuna...for free! 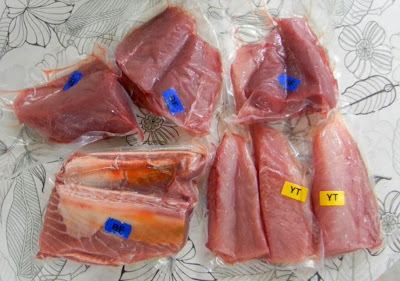 I know it may sound too good to be true, but my neighbor Don joins a group for deep sea fishing every year, off the coast of Baja, Mexico, for bluefin (maguro) and yellowtail (hamachi) tuna. 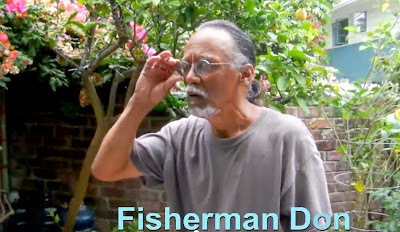 After a successful fishing trip, he'll knock on my door and say: "Come on over with an empty bag, we had a good catch this time." 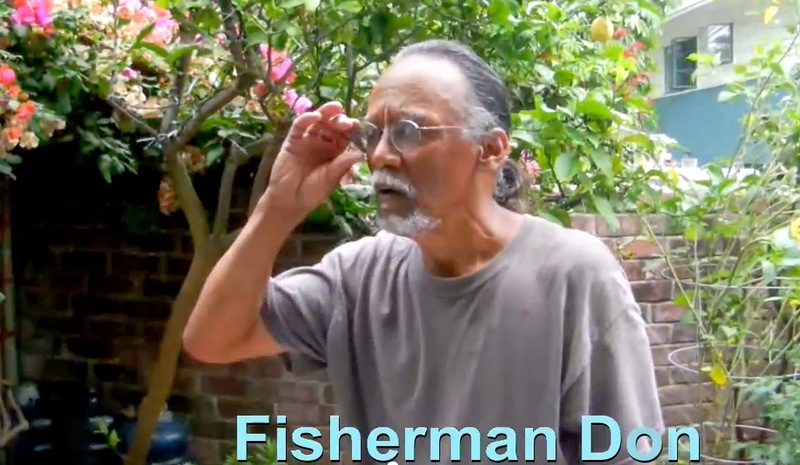 And he hands out 4 or 5 of the most beautiful vacuumed packages of fresh caught tuna -- for free! 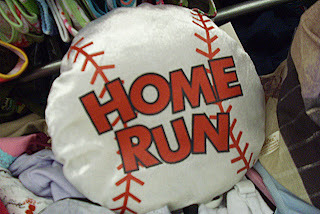 Play it here, video runs 1 minute, 22 seconds. Fish is the most expensive protein (click here to see some sushi grade fish from a downtown Los Angeles seafood market.) And now you know why I can do this Sushi Video Series on the cheap. 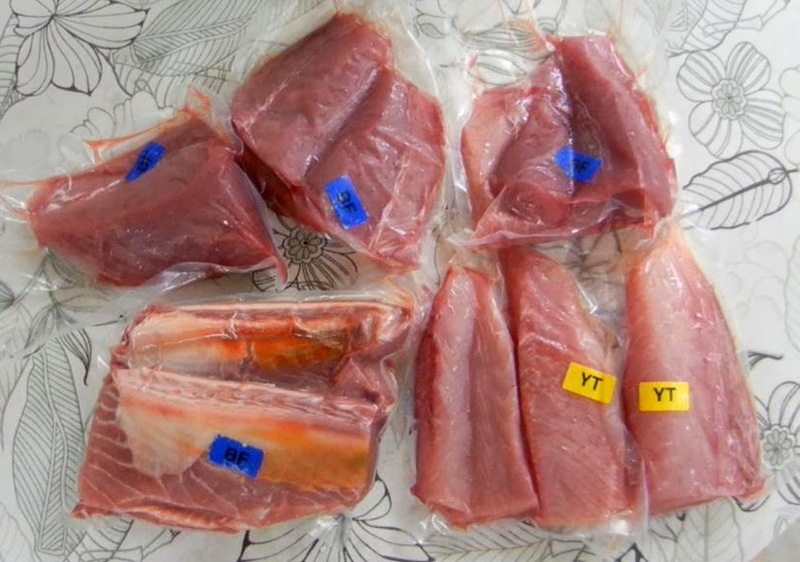 Of course, I know many of you cannot get free freshly caught fish, so I have some sushi recipes using less expensive ingredients -- that anyone can afford. 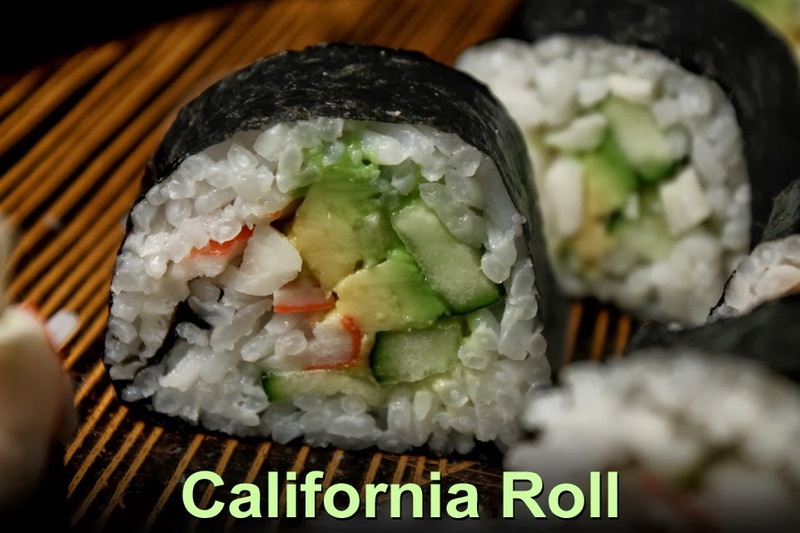 For example, the popular California Roll is made with crab, cucumber, avocado, rice, and wrapped in dried seaweed. The two expensive ingredients are crab and seaweed. 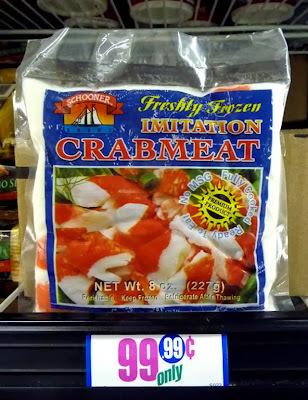 Well, for my recipe I use fake crab, or krab. I like krab and have used it on other recipes (click here to see my delicious Ceviche recipe.) I often find small half pound frozen packages of krab for around a dollar. And from one package of krab you can easily make half a dozen California Sushi Rolls! 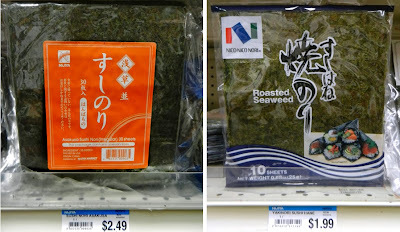 And dried seaweed is about $2 per package in Little Tokyo (downtown Los Angeles.) 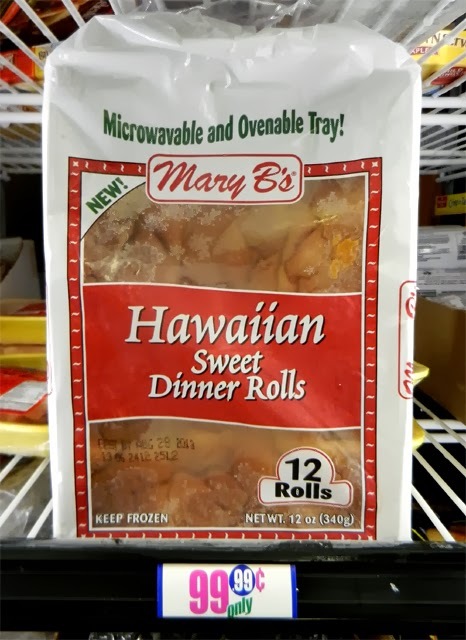 If you have an oriental market in your city, then it can be had for a bargain price - another reason to frequent your local ethnic grocery stores. 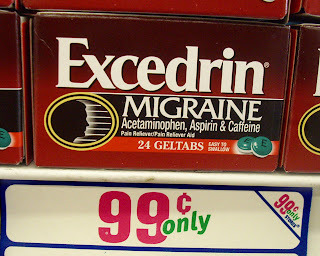 Even at $2 for 10 sheets, that's still only 20 cents per sheet. And I can find 30 sheets of seaweed for $2.49, so that's less than 10 cents per sheet! I also like vegetarian sushi, and you know how cheap veggies are. 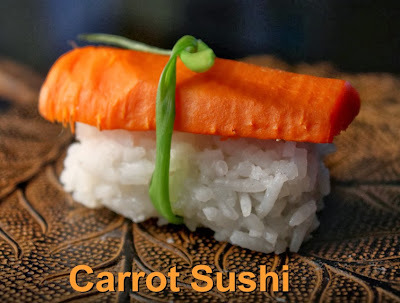 I came up with a tender and flavorful Nigiri Carrot Sushi recipe, made by steaming thick carrot slices in white wine. I also made sushi with earthy mushroom slices. It's a delicious and colorful way to make affordable sushi. 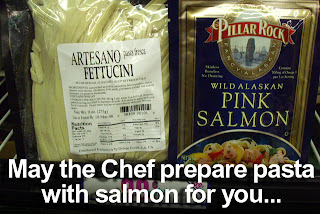 So if you have any favors to cash-in from a fisherman friend, (or if fresh fish comes on sale at your local grocery store) keep checking out my Cheap$kate Sushi Video Series and see the recipes I've come up with, that everyone can afford to do. And remember, it pays to befriend your neighbors! Please sit down and have a glass of wine, and how about a back massage? Well, you are in the right place for a romantic read. Here, let me hold your hand and guide you through my luscious menu of enticing Valentine Day recipes. 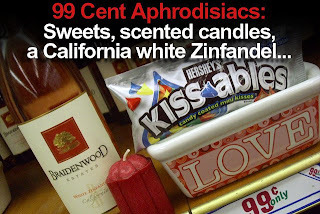 First up, let me set the scene with a video* of the Amorous Epicurean on the prowl for budget aphrodisiac ingredients to create a perfect romantic dinner date. Here, let me adjust your cushion for you -- okay now you can watch it below. You will want to start your romantic evening meal with an appetizer, and a plump and exotic Steamed Artichoke is the perfect dish to share with each other. Just swipe an artichoke leaf into my creamy Ginger Mayo dip and feed the tender petal end to your amour. Your appeitite will surely build as you get to the delicately delicious artichoke heart. My Steamed Artichoke appetizer is just a tease. 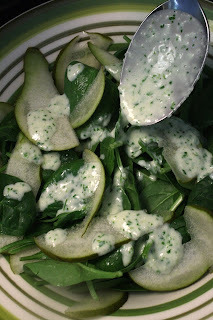 My lovely Pear and Spinach Salad with Creamy Herb Dressing looks good on the plate and will impress your true love with its lightness and fresh flavors. And it's the perfect prelude to the main course. In my Spaghetti alla Carbonara Video below I took a couple of cheap shortcuts. I used bacon bits, but you could substitute real bacon or kick it up a notch with prosciutto slices. Also, fresh shaved parmesan cheese will be more pleasing than the dried brand I used. And finally, I added into the pasta a blended raw egg yolk -- for a more romantic presentation, just place the egg yolk gently on top of the hot pasta. 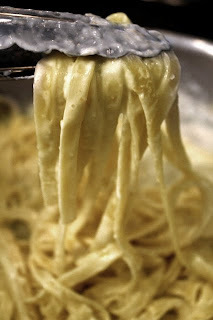 Would you like another glass of wine before you watch my Spaghetti alla Carbonara recipe video below? Oh, don't worry about driving - I'll call you a taxi. For something lighter, lose the cream and serve my stripped down pasta recipe of John Cassavetes Red Pepper, Olive Oil and Garlic with Spaghetti. It's a spicy tongue-tingler any tough guy can assemble. Or if you want to channel your inner domestic goddess, then tie on the apron, get out the pot holders and bring a casserole dish of my luscious Baked Pasta with Cauliflower & Cheese to the dining room table. Just check out the tempting short animated video below to see how it's done. 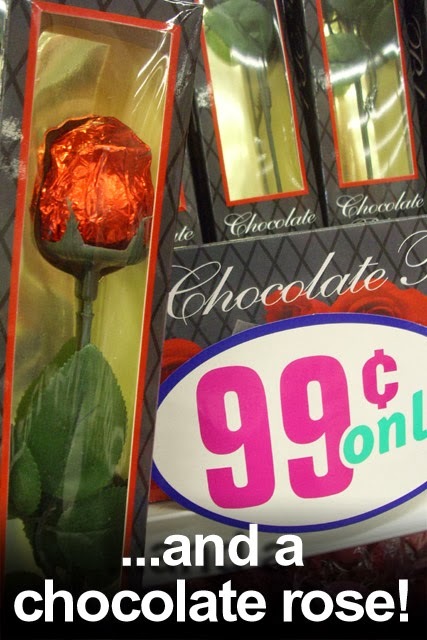 Of course, you can't have a romantic dinner date without the sweets. And I have a simply delicious deconstructed dessert that I call Mini-Banana Puddings. It's the perfect finger food to serve to your loved one. All you need is to lay out some vanilla wafers and stack with a spoonful of pudding and banana slices, finally topped with Hersey Chocolate Kisses. You could also drizzle on any sweet topping like: chocolate syrup, caramel or other favorite candy pieces. It looks good on the plate, but be sure to make plenty, as your lover will ask for seconds! 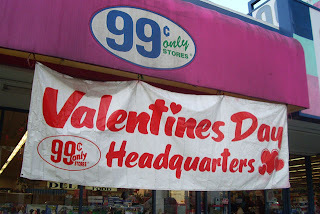 *I couldn't have made the video "Shopping for a Romantic Dinner" without the help of Brandon Flyte (camerawork and editing,) and Chad Reder for the use of his Chad-cam -- so a big 99 thanks to you both! I've had Hash Browns many ways. There's the chunky cubed kind (my recipe here); fast food formed ones, that look like a large flatten tater tot; and Old School Grated Hash Browns. I like them all. With the cubed kind you can add a lot of tasty sauteed veggies like onion, scallion, herbs, and bell pepper (and here's my recipe for that type.) With some fast food types you can eat the large crunchy wafer, dipped in ketchup, with your hands. But there is something about Grated Hash Browns that I like best. Mainly, it's the crunchy outside and tender moist inside that work together sublimely. 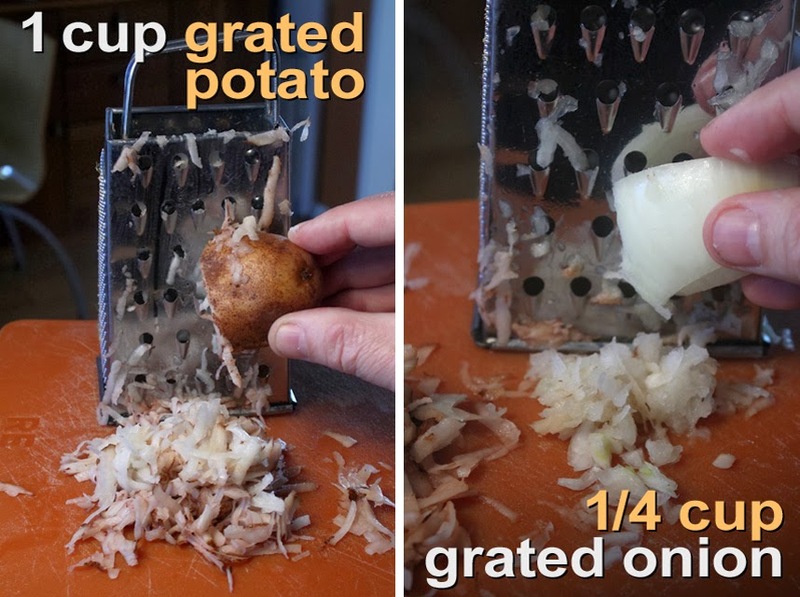 And it's simply done by grating the potato. That makes it easy to spread out on a pan to get even browning and crunch. I guess they are similar to Latkes, except you will use a lot less oil, and no egg -- these Hash Browns are much lighter. 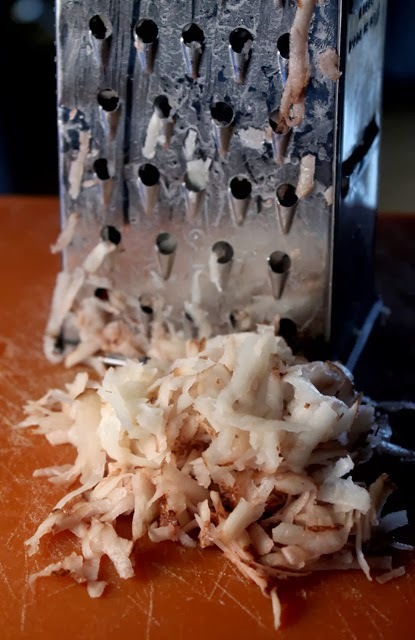 I like to add some grated, or fine chopped, onion to my Hash Browns, but if you are a purist, it's okay to leave the onion out. 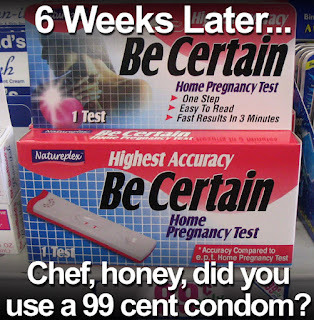 That's it, just one or two ingredients, a little oil, and salt and pepper to taste. 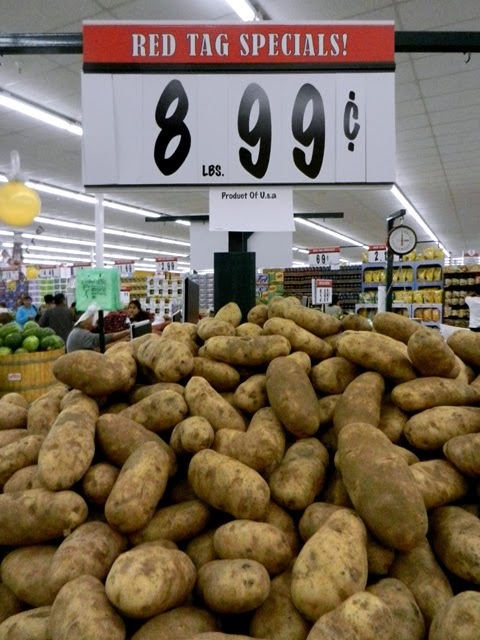 And Spuds are a bargain -- how about 8 pounds of potatoes for 99 cents? Not even yellow onions come this cheap. 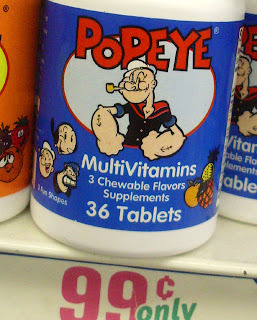 Of course I don't get find these prices every day, but I always get them for way less than a dollar per pound. You could use more expensive red and white potatoes if you have them lying around, but I prefer plain old russet potatoes. They brown nicely and develope a crisp exterior. Also, I like to add a touch of grated (or finely chopped) onion. When caramelized you get a hint of sweetness. Here are some breakfast recipes to pair with my Old School Grated Hash Browns, just click on any name to see recipe: Pastrami and Scrambled Eggs, Eggs Benedict, Swiss Chard and Cheese Omelet, Huevos Rancheros, Jewish Scrambled Eggs, Homemade Egg McMuffin, Breakfast Burrito, Coconut Oatmeal, Chorizo & Eggs Breakfast Tacos, French Toast, Spanish Omelet, Pita & Scrambled Eggs, Tex-Mex Migas, Squash Blossom Omelet, Scrambled Eggs and Refried Beans, Billionaire's Crab Omelet, Sweet Potato Hash, and Fried Eggs on Breadcrumbs with Asparagus. 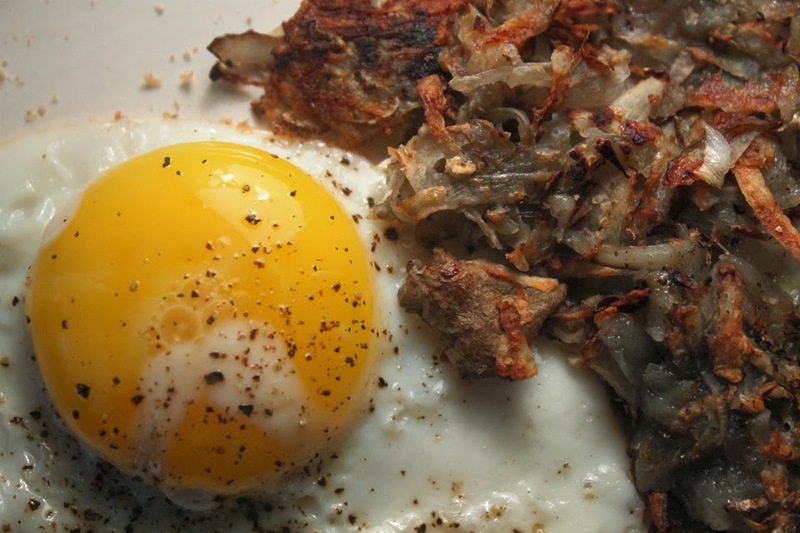 Or pair my Hash Brown recipe with any or of your favorite breakfast recipes. 1 medium potato - about 1 cup grated. Russet potatoes are best. Wash them off - peeled or not. 1/4 small onion - optional. Any type grated or finely chopped (I used a cheap yellow onion.) Okay to use even less onion, to taste. 1 tablespoon oil - any favorite type. Grate or fine chop 1/4 onion (optional.) 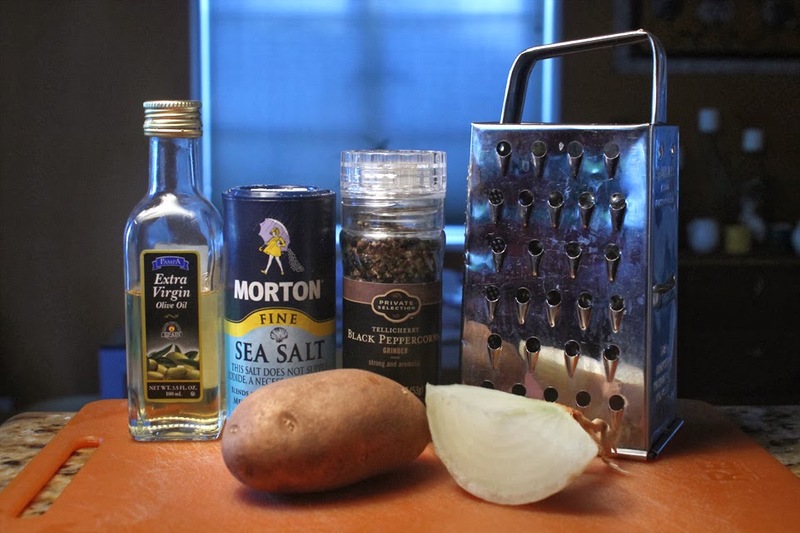 Mix grated potato and onion together. 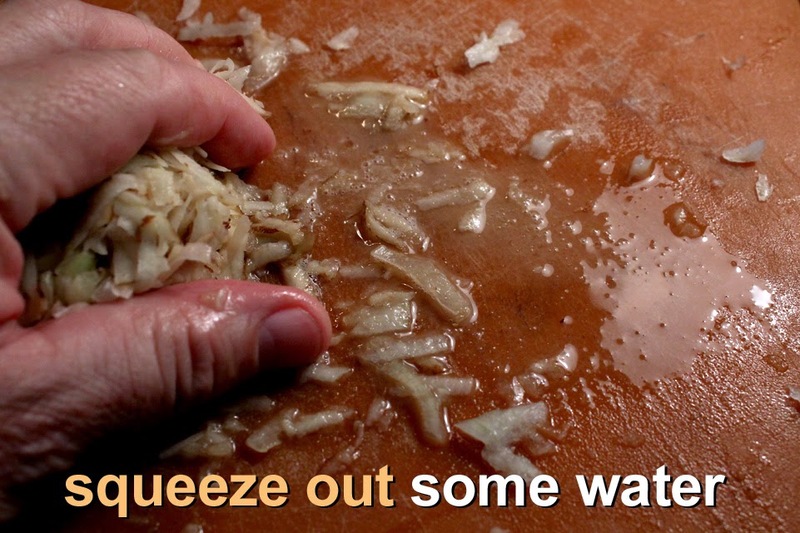 Form into a mound and squeeze the onion/potato with a clean hand to get rid of some liquid. This will make less soggy hash browns. Add tablespoon of oil to a medium hot pan. When oil is hot, add grated potato and onion. Spread it out to about a 1/4 inch thick. Season with salt and pepper. 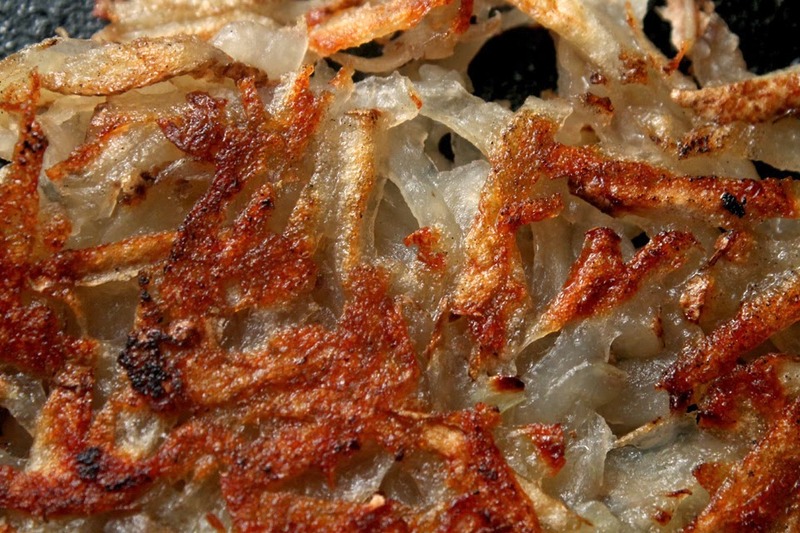 You don't want hash browns spread too thin or they will be all crunch, without a soft center. It's really up to you how thick you like your hash brown patty -- try different thicknesses. Don't stir or break up the potato and onion patty, let it brown evenly on the bottom. After a few minutes, the edges should start to brown. Mine took about 5 minutes. 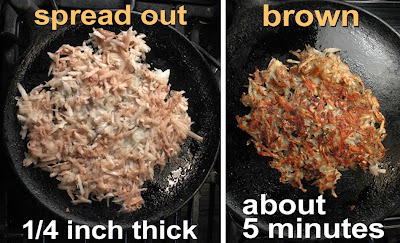 Loosen with a spatula and peak under the hash browns -- you are looking for a nice brown color. Turn them over when brown enough. The other side doesn't need to cook as long, just enough to cook through, about 3 more minutes. Of course if you like your hash browns extra crunchy then cook both sides until brown. Try a small piece of Hash Browns to check for doneness. Serve with the brownest side up, along with your favorite breakfast. I like sunny side up eggs with whole grain toast.